This film-based research project is now finished and the will have its world-premiere during 2018. The film “One Table Two Elephants” is a research film essay that explores the politics of urban environmental knowledge in postcolonial cities. The film is created by Jacob von Heland and Henrik Ernstson and filmed in Cape Town as part of the Ways of Knowing Urban Ecologies research project (PI Henrik Ernstson). See a 5 minute teaser below. During 2015, 2016 and 2017 the 47 minute “first cut” version has been seen by several hundred people—students, scholars and the general public in nine different cities in Africa, Europe and North America, including Windhoek, Stellenbosch, Grahamstown, New York, Palo Alto, Rome, Munich, Trier, and Stockholm. The rich and textured material, which is edited without a voice over, makes present how multiple histories are interrelated across the city. The film provides possibilities for laymen to experts to reflect and deliberate over how a city and its environments can be known and their inherent politics. The full-length 81 minute version of the film is planned to be screened at film festivals in Africa and Europe during 2018. 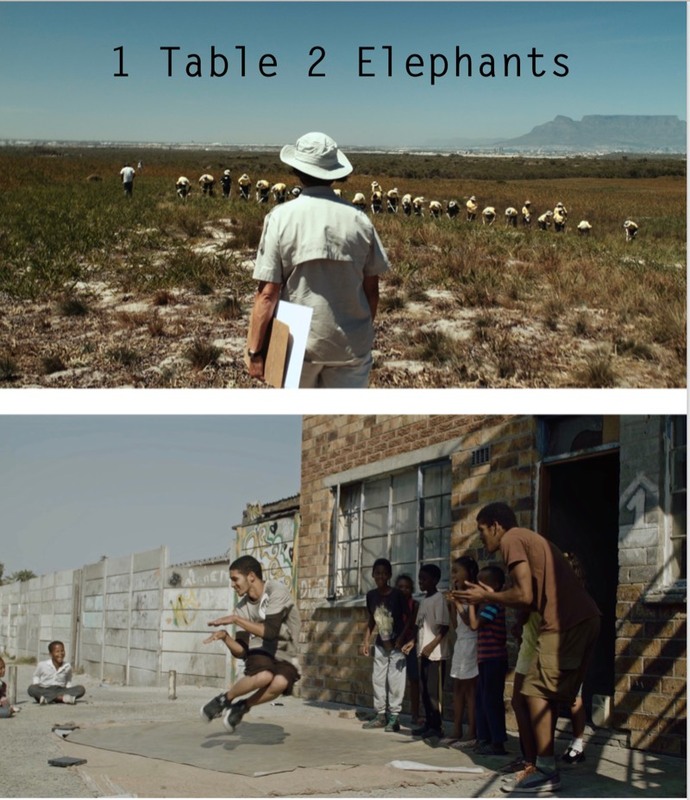 One Table Two Elephants (first cut, 47 min; final cut 81 min) — Created by: Jacob von Heland and Henrik Ernstson together with urban knowers of Cape Town, including Bradley Sitters, Bridget Pitt, Charlie Mbalanda, Dave Halkett, Dieter Schlange, Emile YX Jansen, Fagmee Jacobs, George Davis, Gregg Oelofse, Kelvin Cochrane, Leeroy Philips, Lance van Sittert, Mr Isaacs, Nceba Felix Mangesi, Patricia Pat Holmes, Philip Bam, Stefan Benting, Thola Antamu, Tim Hart and Tanya and Andrea Eckstein. Photography: Johan von Reybekiel. Sound: Jonathan Chiles. Assistants: Nceba Mangesi and Jessica Rattle. Funding: Swedish Formas & Markus and Amalia Wallenberg Foundation. Produced by: Telltales Film and The Situated Ecologies Platform in collaboration with the KTH Environmental Humanities Laboratory in Stockholm and the African Centre for Cities the University of Cape Town. Funded by: The Swedish Research Council Formas and the Markus and Amalia Wallenberg Foundation.